Whispers in the Loggia: "A Holy Man, A 'Friend of God'" -- Miami Mourns Its Cuban "Saint"
"A Holy Man, A 'Friend of God'" -- Miami Mourns Its Cuban "Saint"
These Easter days have brought the loss of an iconic figure of the modern Stateside church as Bishop Agustín Román -- the retired Miami auxiliary revered as the "godfather" of the Cuban exile community on these shores -- died Wednesday night at 83. Expelled from the island at gunpoint alongside some 130 other clerics in the wake of the Castro Revolution, Román served as the exile's spiritual "beacon" in South Florida since the late 1960s, when he was charged with building the National Shrine to Cuba's patroness, the Caridad de Cobre (Our Lady of Charity). 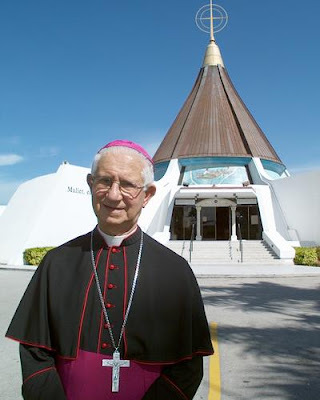 Named the US' first Cuban bishop in 1979, he continued to live in a one-room apartment at the Ermita -- built facing Cuba on Miami's Biscayne Bay -- following his 2003 retirement, and died there just before he was to teach an evening catechism class in a new religious education facility on its grounds that bears his name. Famed for an example of deep humility, tireless spirit and simple wisdom, the prelate (who never stopped perceiving himself as the "peasant" of his boyhood) made national headlines in 1987 after defusing an outbreak of riots in US prisons led by Cuban detainees. Having cared for many of the rioters' family members over the years of their confinement -- a witness that, so it's said, led the men to drop their weapons at the mere sight of him -- Román reportedly turned down Hollywood overtures to buy the rights to the story for a film. While his homeland's Communist regime has made plodding strides toward increasing religious freedoms and hosted two papal visits over the last 15 years, the bishop refused to return to Cuba until Marxism's demise, telling one interviewer that "I was expelled because I was a priest and I am still a priest." Román watched the events of last month's PopeTrip with his faithful at the Shrine, where a projection TV was set up in the sanctuary. Even as he was grateful to the US as "the nation that welcomed [him]," despite spending most of his life away from the island, Román maintained to the end that "I am a Cuban." Among his adopted own in Miami, meanwhile, one local summed up the widespread sentiment toward him some years back with the musing that "We're living in the presence of a saint." 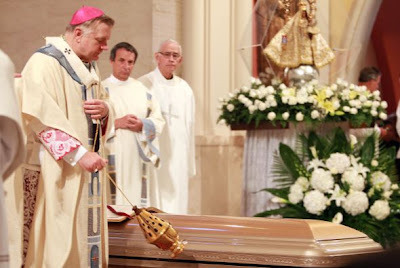 The bishop's passing notably came three days after Pope Benedict declared the heroic virtue of an earlier exiled Cuban freedom-fighter in the States, the 19th century priest-journalist Felix Varela, leading Miami Archbishop Thomas Wenski to pointedly declare Román the "Varela of our time" at the news of his death. When Wenski repeated the line at this afternoon's funeral, a crowd that included several hundred standing in St Mary's Cathedral erupted in prolonged applause. Paying a rare tribute to an auxiliary, the papal nuncio to Washington, Archbishop Carlo Maria Viganò, concelebrated the farewell Mass, joining the bishops of Florida and the Vatican's emissary to Haiti, Archbishop Bernardito Auza, as well as a delegation of Cuban bishops led by their president, Archbishop Dionisio García of Santiago. On his arrival yesterday, García celebrated a memorial Mass at the Ermita during the 36-hour viewing that stretched through the two nights preceding today's rites, which were aired live on local television. The bishop's longtime assistant, Deacon Manolo Perez, proclaimed the Gospel at today's sendoff, as the replica statute of the Caridad looked on after making a rare journey from the Shrine. In 1976, Wenski's first Mass as a priest was preached by then-Msgr Román, and on the native son's installation as head of the 1.3 million-member Miami church in June 2010, the senior auxiliary memorably led the rites of welcome at St Mary's doors. Now, three weeks after delivering a strong message in the pulpit of Havana cathedral that made global waves, the archbishop memorialized the exile legend in a homily delivered in Spanish, given here below in its English translation. Let me begin by greeting his Excellency, Archbishop Carlo Maria Vigano, the papal nuncio to the United States. This Church of Miami welcomes you; and, we thank you for representing the Holy Father today at Bishop Roman’s funeral Mass. And, of course, Pope Benedict is doubly represented today with the presence also of the Apostolic Nuncio to Haiti, Archbishop Bernardito Auza. I also greet Archbishop John Favalora and my Brother Bishops from the Ecclesiastical Province of Florida as well as Archbishop Dionisio Garcia of Santiago de Cuba, Bishop Mario Mestil of Ciego de Avila, and Bishop Emilio Arranguren of Holguin who are here to represent the Church in Cuba. Your solidarity with us today is a living witness to the theme of the Jubilee of the 400th Anniversary of the Discovery and the Presence of the Virgin of Charity in Cuba: A Jesus por Maria, la Caridad nos une (To Jesus through Mary, Charity makes us one). To Bishop Roman’s brother and sisters, to his nephews and nieces, we present our condolences. For the many priests here, Bishop Roman was also a brother and a father. This entire community – Catholics and non-Catholics, Cubans and non-Cubans – feels somewhat orphaned today – not only the hundreds of us who join you here at St. Mary’s Cathedral to pray for your brother but also the those who visited the shrine Thursday night and all day yesterday as well as those thousands who are following this Mass by television or by radio throughout the United States, Latin America, and Cuba. The cross of grief is never easy but you – we - do not bear it alone. These last three weeks have been days of great intensity: the visit of the Holy Father to Cuba; the liturgical observances of Holy Week and then Easter Sunday and its octave which concludes tomorrow. Bishop Roman lived these days with that joy that comes from faith. The pastoral visit of the Holy Father, he was convinced, would bring great fruits to Cuba and the Church there as did Pope John Paul II’s visit 14 years ago. And, of course, Holy Week– as it always is for all Christians – was a week of grace; and for Bishop Roman, Holy Week was also a week full of even more opportunities to preach, to teach, to hear confessions: in a word, to evangelize. On Easter Sunday, the “alleluias” sung to announce Our Lord’s Resurrection were made even more joyful by the announcement that the Pope had declared Father Felix Varela “venerable”. We, of course, are still in the octave of Easter, eight days celebrated as if they were only one day of Easter. And, it was during this octave of Easter, with its joyfulness of new birth and renewed hopes, that God in his inscrutable ways called Bishop Roman home after a life of dedicated and selfless service both to the Church and to the Cuban nation. When I learned of Bishop Roman’s death on Wednesday evening, I said: The Archdiocese of Miami has lost a great evangelizer who preached the gospel to all. And the Cuban nation has lost a great patriot. Bishop Roman was the Felix Varela of our times. One’s native land is the common good of all citizens and as such it imposes a serious duty. Like Varela who said “No hay patria sin valores” ("There is no country without values"), Bishop Roman understood that he was not less of a Patriot for being a Catholic and not less of a Catholic for being a patriot. 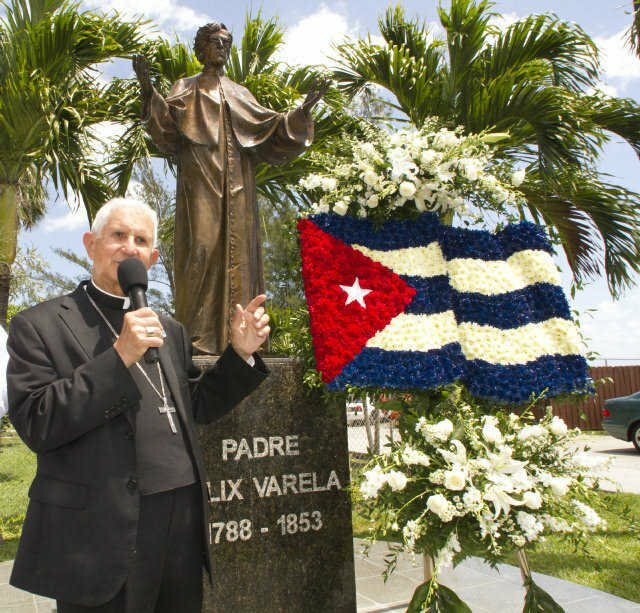 This Varelan synthesis of religious faith and civic duty also explains the importance of the Ermita for the Cuban Diaspora – and for the work that Bishop Roman did here. We could say that the Shrine was built as a rebuke to the lie of Marxist Leninism that enslaved Cuba 53 years ago. Ideological materialism pretended that God did not exist and tried to erase all trace of God from Cuban history and to destroy the religious identity of Cuban nation. The mural that adorns the shrine tells the true story of Cuban history – a history which acknowledges the contributions of men and women of faith in the life and the identity of the Cuban nation. But also Bishop Roman saw the shrine as an antidote to the practical materialism that threatens the life of faith even in this land of great freedom and opportunity. This practical materialism, which values people for what they have than for whom they are, pretends that God doesn’t matter. A few months ago, friend of Bishop Roman told me how the Bishop had changed the course of his life. When he began his career in health care, he had allowed, for what he thought was for good business reasons, some doctors to perform abortions at his clinics. Padre Roman had found out – and went to call on him. “Do you believe in God”, Padre Roman asked him. “Yes”, he replied. And then Padre Roman – who embodied at the same time both profound humility and ardent courage said to him: “ni uno mas; ni uno mas” (Not one more!). And there were no more. Bishop Roman’s life was lived and coherent witness that God does matter and that because God matters so do the creatures made in his own image and likeness, no matter how weak or how vulnerable. Bishop Roman never tired of putting before us the words of Mary, spoken to the servants at the Wedding Feast of Cana: “Do whatever he (Jesus) tells you to do”. And Bishop Roman always insisted that to be devoted to Mary meant imitating her – in her trust and in her obedient faith. In the Haitian Creole language, the word for “saint” is simply translated “zanmi Bondye”, literally a friend of God. Bishop Roman was a holy man and a totally committed priest – he was a “friend of God”. He befriended us and worked tirelessly simply to make us also “Zanmi Bondye”. Pray for us, Holy Mary, Mother of God, that we may be made worthy of the promises of Christ. Our Lady of Charity, pray for us! Virgin of Charity, save Cuba!